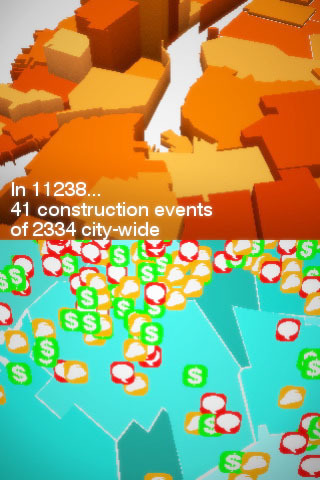 BuildingBeat is a social platform for urban development. Monitor construction activity, start a discussion around a building and participate in designing your ideal city. Engage in urbanism. The city is continually re-making itself through construction in a contentious process that rarely has citizens' best interests at its core. BldgBeat allows you to access open-source NYC data to stay on top of construction and visualize the myriad factors that drive development in your neighborhood. BldgBeat is a social platform for interacting, advocating and policing building activity and design in the place that matters most - your community. 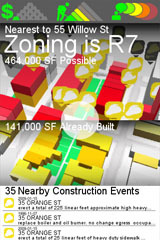 BldgBeat's map feature allows you to experience construction and development in a highly visual and tactile way. Roll over new construction activity and hear the sounds of the city changing. 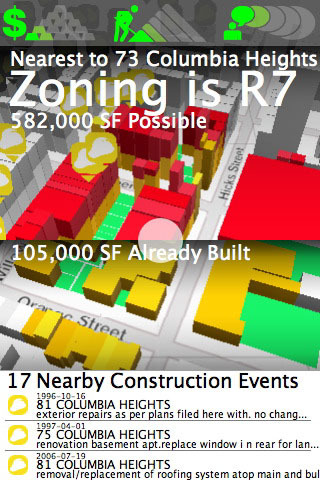 The unique split-screen view uses NYC Zoning designations to to visualize potential development in your neighborhood.Interactive gauges give you a quick overview of the status of your area: is your area underbuilt or near capacity? Does the current zoning favor big development? Where is construction activity concentrated? All of these question are brought to light simply by exploring the interactive map. At any point, you can drill downwards or zoom out to get the big picture. Use BldgBeat to improve the quality of your neighborhood. BldgBeat will notify you of both important construction and suspicious activity. By tapping into NYC's published Building Permits data, BldgBeat allows you to survey the landscape of changes being made to your city. It lets you share your views, vote up and down on projects and work with fellow users to police bad construction practices, as well as promote positive development!. BldgBeat, coming soon to the Apple iTunes store. BldgBeat currently works within the boroughs of Manhattan and Brooklyn. Bronx, Queens and Staten Island available soon. 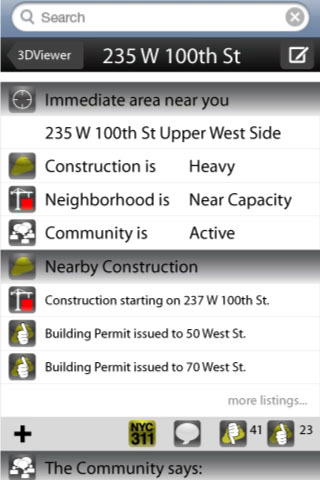 Alerts based on new, suspicious or featured construction activity. BldgBeat also alerts you to community meetings and relevant comments by other users in your neighborhood. Browse through a complete map of buildings, construction activity and development envelopes in an interactive map that gives you tactile as well as visual feedback. Participate in a discussion on the quality of construction in your hood. Report to 311 and the Buildings Department on un-safe or negligent contractors. Promote projects you think will improve the city. Share outcomes on planning meetings. Interactive map of city-wide construction.View both individual construction projects or aggregated into zip codes for a comprehensive look at activity in New York City. Cycle through zoning options for your area, with intuitive visualization of the resulting development. 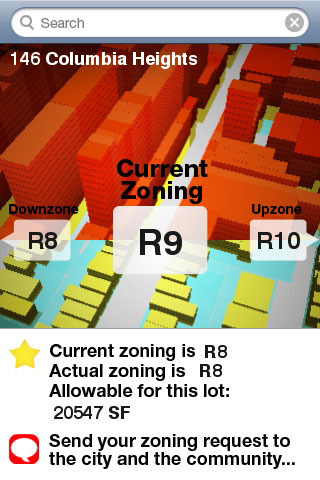 Turn your view on increasing or decreasing your neighborhood's capacity into formatted "upzone" or "downzone" requests and submit them to NYC City Planning. Fully interactive Java applets that let you interact with BuildingBeat technology. Using Permitting data from NYC Data Store. BldgBeat is developed for the NYC BigApps competition by Proxy, a design firm that works with computation and space. Proxy explores artificial intelligence and generative systems in a variety of platforms, including architecture and software development. Proxy is Mark Collins and Toru Hasegawa. 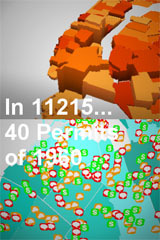 BldgBeat was developed in collaboration with Ben Reich. Proxy is implementing a series of apps around the themes of dynamics, gaming, spatial tagging/mapping and distributed intelligence. More information can be found at the Proxy Homepage.